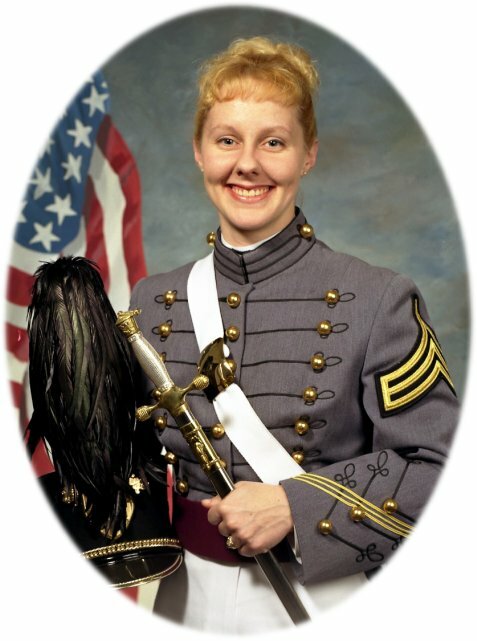 Becky was my best friend at USMA. She was the kind of girl who is unique, beautiful without needing makeup or any kind of embellishments, and unique. We were in the glee club togeher, and from the first second I saw her I knew we were meant to be friends. Becky was never known for conformity. That was one of the things I like most about her. She danced to her own beat, and she was my partner in crime as well as myriad goofy adventures both during and since USMA. We were inseperable. I had no doubt that, someday, we would either have our dream band in Manhattan or at least find travels together in our different parts of the world, as we often did. She was the kind of friend who you could not hear from for a year and then pick up right where you left off. I once got a box from her when she was in Germany after not hearing from her for six months, because she wanted me to try some new chocolate candy she had just tried (I was in Iraq) and couldn't wait for me to get back. It was incredibly thoughtful of her. One of the finest pilots in the Army, she was selected to fly medevac flights for at least two tours in the middle east... and did a fantastic job even in a field where women have a hard time proving themselves. I miss her. She was one of the few people I ever met who, like me, was different. She brought a refreshing touch of style to the Army. Her musical abilities, her laughter, her fashion-forwardness set her apart. You couldn't help but notice her, no matter whether she made herself up or not. And her laugh and smile could light up any room. It's awful that someone missed all that, that she could ever feel like she wasn't the vital, worthwhile, intelligent, wonderful and LOVED woman that she was. There is no way to fill the void she left by leaving us, I can only pray that she's in a better place. I hope I see you again Becky... I miss you.